GREENSBORO -- A woman walked into Ralph Havis' restaurant one day and asked the unthinkable. "Have you got anything for someone on a diet?" Proprietor Ralph Havis takes Jody Mason's lunch on Wednesday. 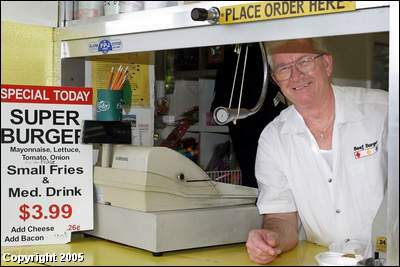 Just steps away from his spot near the cash register, a steady supply of hamburgers is dipped in a tangy homemade sauce and broiled on a revolving grill. Even foods normally considered to be healthful -- such as carrots, zucchini and squash -- are battered and deep-fried and served with a creamy sauce. If the wind is blowing just right, the smell of grilled burgers and grease wafts over all four lanes of West Lee Street. "Lady, you might as well turn around and get back in your car because I'm here to fatten you up," Havis said. She laughed, then ordered the biggest burger on the menu. 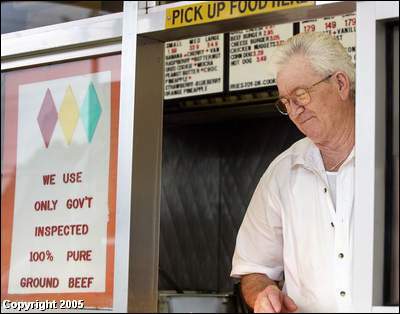 Ralph Havis been broiling, serving, and eating Beef Burgers for the past 44 years. This slice of deep-fried, artery-clogging heaven near UNCG once was called Biff-Burger, a chain of drive-up hamburger stands that sprouted from Florida to Toronto in the mid-1950s. Biff, which stood for "best in fast food," became popular throughout the Southeast. Havis was 18 when he walked into the Biff-Burger on West Lee Street and asked owner Pete Dunford for a job. "I thought it was sissy work at first," Havis said. "I'd only seen women cooking. ... I've changed my outlook a whole lot." Dunford paid $1 an hour, and in those days, you could buy a hamburger, fries and soft drink for 47 cents. "Man, I thought I was making big money," Havis said. One month later, Havis became a manager. Dunford treated him more like a son than an employee and promised Havis a good future in his business. "He couldn't run me off, I guess," Havis said. In the mid-1960s, Burger King began buying Biff-Burger restaurants. 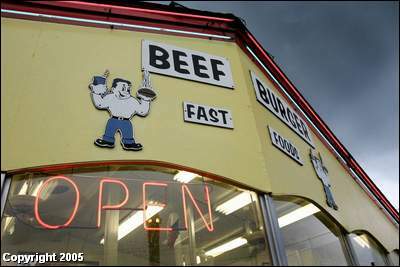 To avoid confusion, Biff-Burger owner Homer E. Griggs changed the name of his remaining restaurants to Beef Burger. 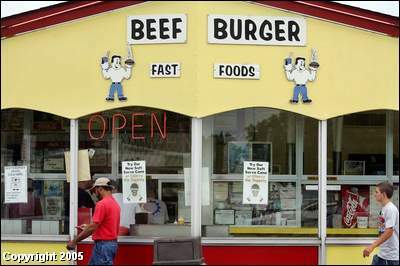 Havis, who bought Dunford's franchise 10 years after he started working there, owns the last remaining Beef Burger. It now qualifies as a Greensboro institution. One of the regulars is Danny Allred of Yadkinville, who usually orders two Beef Burgers, fries and a soft drink. If he's really hungry, he'll eat three. Allred, 50, can remember when they cost a dime. A super burger, fries and drink now cost $3.99. A lot hasn't changed. The dining room looks pretty much the same as it did when Havis enclosed it 30 years ago, and the exterior is vintage '50s with yellow, turquoise and red panels. 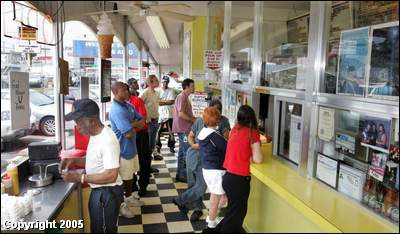 Customers place their orders at the glass window that divides the rotisserie and fryer from the serving line. Plastic ice cream cones dance overhead, their movements orchestrated by a ceiling fan. Warm burgers and fries in hand, Allred's family would gather in yellow booths the color of lemon meringue pie and fill their bellies until all that was left were smudges of mayonnaise and sauce on their fingers. 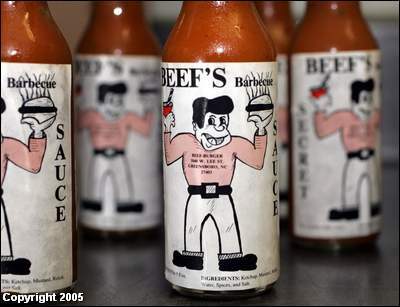 The sauce is what makes Beef Burgers unique. Havis makes it himself. The mixture of pickled relish, ketchup and mustard tastes like a mild, sweet barbecue sauce. Beef Burgers are dipped in this concoction after they are broiled. Customers can order their burgers double dipped or with extra sauce at no charge. It has been bringing customers back for generations. Allred's 4-year-old grandson, Nathan, recently ate his first Beef Burger and selected the toy truck displayed in a window by the register to go with his kid's meal. "He was tickled to death," Allred said. After 40-some years, Havis knows many of his customers by name, as well as what they will order. Most of them are down-to-earth working-class folks who like good food, Havis said. He posted a sign on the window recently that sums up his business mantra: "We're in a poor neighborhood, with a rich outlook; and we have a darn good burger." Regulars such as Allred share fond memories of family outings when they could buy 10 burgers for a dollar. But Havis' memories go beyond burgers. It's where he's lived his life. One day, a young woman with the prettiest brown eyes he had ever seen stopped in and ordered a fish sandwich. He called her later. "I'm the tall ugly fellow at Biff-Burger," he told the woman named Alma. The burgers are dipped in a special tangy sauce. She would later become his wife. Their daughter, Tammie, played here as a child and worked here as a teenager. "There's some bad days," he said. "It's been mostly good, though. The only bad was losing my daughter." Tammie Havis was weaned on Campbell's bean soup at the restaurant. Later, it was Tammie who encouraged her dad to add items such as fried cheese sticks and zucchini strips to the menu. She died of lupus about eight years ago -- a loss Havis still hasn't recovered from. She was 33. "I'd give anything to have my daughter back, but God doesn't make deals like that, I guess," he said. At 62, Havis has a bit of high blood pressure, which he says comes with age and the business he's in. Otherwise, he claims to be in perfect health. Not bad for a man who has spent the past 44 years broiling, serving -- and eating -- Beef Burgers dipped in that special sauce. And with more than 100 items on the menu, including fried macaroni and cheese, Havis said he never tires of eating the food his restaurant serves. There's just one thing he can't eat: a veggie burger. "I tried one once," he said. "All I could eat was one bite. That's the one thing that I have that I couldn't eat myself." Marvin Bowser and Allen Dale head to Beef Burger for lunch Wednesday. Ralph Havis serves customers lunch Wednesday. 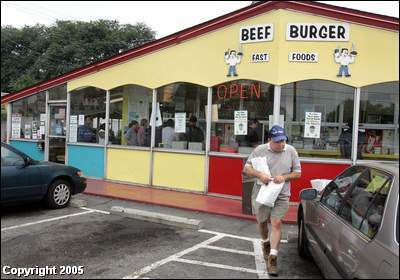 Customers line up for lunch at Beef Burger in Greensboro. Ken Martin gets lunch to go for workers. 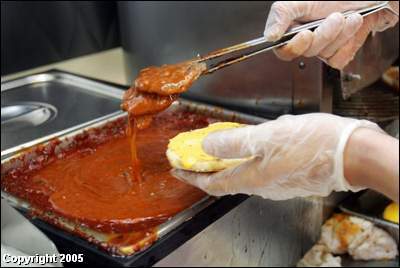 A hamburger from Beef Burger gets dipped in a special tangy sauce.